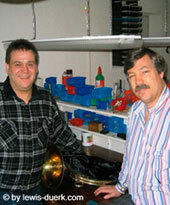 Since 2004, Dietmar Duerk and I have been partners in the design and construction of three distinct models of horns. I needed an alternative to the Lewis horn because of heavy back orders, and Dietmar needed to broaden his product line. Clients and friends have often encouraged me to get assistance in building my horns, but I feel it is important to control the design and construction of every part of my horn making process. When I met Dietmar I realized that I could only work well with another person if they were already a master instrument maker. Thus, three Lewis-Duerk horns were conceived and created: LD-X5, LD-X6 and most recently, the Clevenger Model. Without exception, each model is inspired by the original Lewis horn and my approach to horn making. Various components of the horn are produced in my shop and others in Germany. We developed three unique models, each with a slightly different focus. The LD-X5 F/Bb double horn is influenced by the design of Carl Geyer horns and emulates only the very best characteristics. Since I own the Geyer Company, it seemed fitting to have a horn patterned after this legendary design. The LD-X6 Bb/ high F double descant horn is based on a design I created many years ago. Our newest creation is the fabulous Clevenger model, an homage to my dear friend, teacher, and colleague, Dale Clevenger. Lewis & Duerk horns can be specially ordered through Steve Lewis. Please inquire.